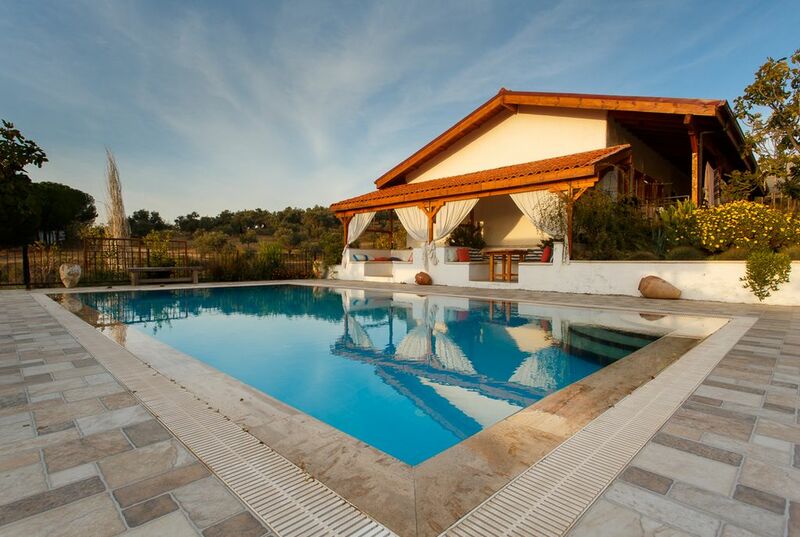 Ionia Guest House is a rural bed-and-breakfast here in Turkey’s Aegean region. Our two rooms (soon to be four) are spacious with ensuite bathrooms and private verandas. There’s a swimming pool with a large terrace, and a cafe serving local food. The hotel is set in a fig orchard surrounded by olive groves — think of our place as a country oasis where you can rest and recharge. As seen on TV! For about a year we were filmed for a show called “Our Dream Hotel”, about newcomers to the hotel industry. So far we’ve been on in the Netherlands, Australia, the UK, Sweden, and New Zealand. And anyone who saw our TV episode will know that we’re passionate about green building and used 100% local materials to build the hotel. The walls are timber-frame, with straw bales laid out like giant bricks, and then covered in layers of lime plaster. The result is excellent insulation for both temperature and sound. Our place is just off the route from Ephesus to Pamukkale. It makes a great base for exploring the stunning archaeological sites of the Meander Valley and ancient Ionia, including Priene, Magnesia, Tralleis, and Miletus. We’re also a good choice for visitors interested in local markets, authentic Turkish food, and exploring the natural landscape. Kitchenette with a fridge freezer, kettle, tea, coffee , sugar, salt and pepper, kitchen towels, cutlery, glasses, plates, milk and drinking water available. We certainly fell on our feet here! Not only was the property lovely, but so were the owners. Taking a break from touring and staying in different hotels every night we had booked to stay for four nights with Jason and Sirem. The breakfasts were wonderful (and a work of art!). It was nice to have three delicious suppers each time feeling like we were visiting old friends rather than as hotel guests. Also a fantastic location for sight seeing. We made it to Pamukkale one day as well as the more local sites.....Perfect! Stay here if you are in the area!! Stewart, thank you so much for the warm recommendation. We're really pleased that our place worked well for you. You were lovely guests: it was a pleasure to host you both and we hope to see you again one day. Ancients sites and ruins, national parks and beaches are maximum of 45 minutes drive away. We recommend our visitors to hire a car at the airport due to our rural location. Please check out our website for detailed information on local attractions, how to get here and for more photos.